Forests and trees store carbon, which helps mitigate the impacts of climate change in, and around, urban areas. Woodfuel sourced from urban trees and planted forests on the outskirts of cities provide renewable energy for cooking and heating, which reduces pressures on natural forests and our reliance on fossil fuels. 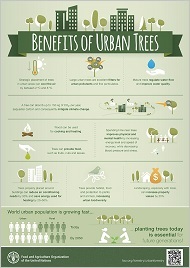 How much do you know about forests and cities? Why should we plant trees in cities?